And please don't use more than one exclamation point at a time. Or ALL CAPS. Who are these people? Comic Sans is one of the most annoying fonts that is over used. But heaven forbid you actually pay attention to capitalizing the correct words. You know, like "lemonade stand." Pot, meet kettle. 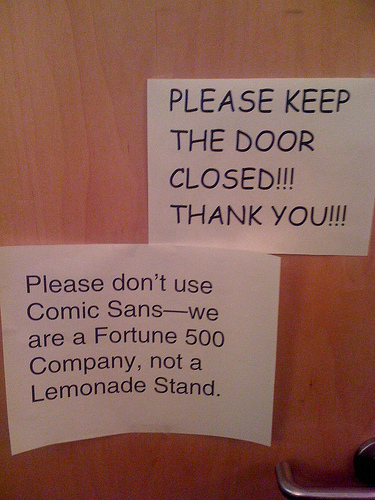 You, I think 90% of the people who complain about Comic Sans do so only because they've seen others complain about it online. Are there really that many typographically sensitive people in the world? I think not. I think, as far as fonts go, that Exotic 350 is worse than Comic Sans. Exotix 350 has this weird mix of capital and lowercase letters. It looks trashy to me. There's a wealth of overused and/or ugly fonts out there. Every time someone uses comic sans a kitten dies. Don't kill kittens. Personally all this brouhaha over a font is ridiculous. Isn't the message more important than the form it is delivered in? I liken you font elitists to those not being open minded to hear what someone that speaks with an accent has to say. Is the exact same thing. Both are truly stupid philosophies. Heaven forbid anyone reading something in an ugly font. What's next, ugly people cannot speak? Must be nice to be so much better than someone else. BTW the idea that using all caps means a person is yelling goes back to the beginnings of the Internet. The idea is complete hogwash. Do you go out of your way to be an douchebag or does it just come naturally?